Last night the BBC broadcast the second programme in the two-part series entitled Traders: Millions by the Minute. The first programme showed the professionals making millions by the minute, the second programme did not. Instead, with one exception, we got to see amateurs, losing. The fact is that the vast majority of home traders lose money. In financial trading it is easy to make money in a bull market, you buy and hold. In volatile markets there is the temptation to trade the swings, long and short and with disastrous results. The problem for financial day traders is that most markets are rigged for the benefit of the professional élite. If the price isn't rigged then the market you trade in will be. Either the price is manipulated or the market you trade in is front run. 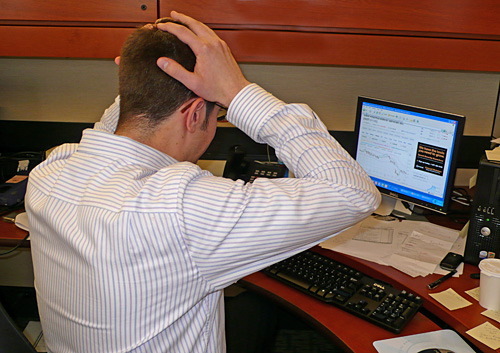 Sports trading is a different matter but still, most sports traders are losing traders. Although sports rigging is commonplace and insider trading in horseracing is common too, the playing field is more level between the professional and amateur bettor. Buy and hold lasts only until the end of the event so most trades are very much day trades. In last night's second programme we saw a house wife making a million but only on paper. When she started using her own money, she lost. A common occurence for traders. The psychological aspects of using your own money are vastly different to paper trading. You will take more risks on paper and may get a long run of success, reinforcing in your mind that you are a good trader. However, that may just be down to luck. After all, a risk taking loser on paper would probably not want to trade with their own money. We got to see a lucky loser on paper, lose it in reality. When you start using your own money you might be more cautious and the reality of being just another trader snatching pennies in front of a steam roller might be too much to bear. You either give up because you are not going to be as rich as you thought or you take on more risk and blow up. We saw a team of retirees gambling their pensions on the stock market. They looked and acted professional but even they started to lose money. Again, they found it easy in a bull market and got out of their depth through over-trading a volatile market. A former antiques dealer knew all the terminology but he just couldn't trade. He was happy to lose money, year after year, to keep him from selling another chest of drawers. There was a pair from Birmingham but I didn't know what to make of them. Maybe the BBC's usual multi-cult shenanigans in action. We saw the pair in their parents' house plotting to become 'trillionaires' then driving off in a flashy car to drum up business from black footballers. At least they had the sense to risk somebody else's money. At the end of the show, and unlike the other traders, we were not told how they were getting on financially. I suspect they are still living with their parents. The only winner I could see was a rather narcissistic chap. He had made over a million pounds from day trading and had been given a multi-million pound fund from The City to trade. The narcissist probably has all the skills needed to be a winner; single-minded, self-absorbed with a touch of obsessive personality disorder. His house was immaculately clean, his body immaculately toned in a gym, his Porsche gleaming immaculately in the sunshine. A life dedicated to being good at everything and that includes making money. Hi James - Firstly, this is the best site on the internet imo for the serious bettor. Some great articles. Your SmartSigger article this month regarding trading was a good read. I too are a bot programmer and have decent success auto trading. Do you exclusively concentrate these days on sports trading ? With Betfair continuing to marginalise the exchange in favour of the sportbook, together with the Premium Charges (I will be a PC2 payer within the next 18 months), I have thought of dipping my toe into Forex trading. As the program showed, it ain't easy! But hey, I thought that about sports trading for the first 5 years until I made it pay. As you mention in your article are the Financials so rigged against the retail bot trader that it is not worth taking the plunge? You have mentioned in previous articles your background in this arena, I am curious to know why this isn't still your main focus. Thanks for your kind words about this site, Craig. Sports trading is a small part of my investment portfolio. I have very little in conventional banking, for obvious reasons. A lot of my money is spread amonst four P2P lending sites, some gold/silver bullion, Bitcoin. I am put off by conventional investment asset classes because of all the rigging with the exception of bullion. The rigging of that can't last forever. Bullion has real value unlike all the bits of paper. You can try ForEx if you want but chose your market place carefully. You have many to chose from. I would assume CFDs, binaries and spread betting would have large spreads. A prop trader might get direct market access with a smaller spread but then there is a risk of that market being part of a dark pool and/or front running. You need a lot of money to get into those markets so that leaves you with betting on ForEx and being led by the real markets. In sports trading you are in the real market, Betfair. You need to find definite moves be they trends or hunches about central bank announcements or whatever. Ultimately, with currencies being fiat, they are all racing each other to the gutter. I can't see any of the main currencies sticking its head above the parapet and increasing base rates. Look to Japan, over twenty years of low rates. Stick to what you know and do it well. If what you do can be done in new markets then you have scalability and you can earn more. I have quite a pessimistic view of the future so for the last few years I have slowly sold almost everything I had on eBay. Amazon etc. Everything you own is worthless when you die so why buy anything to keep the rich in their position of power? I live a lean life, sold most books, my childhood games, all CDs and DVDs but digitised it all. I just have a computer, some DIY and cooking equipment, clothes and a car. I grow my own veg and don't eat processed food. Healthy body, healthy mind. My money is spread around a portfolio that represents my pessimistic view. No stocks, they have to correct because they are just bought with vacuous printed money. I worked in The City and didn't like what it stood for. Sports betting gave me a way to utilise what I know in a somewhat cleaner market environment. If the narcissistic guy is a millionaire I bet this is how he became one. Yes, it's striking that he didn't say a word about ezeetrader as I recall, yet it must be taking up a lot of his time and you do wonder where he's really making his money from. I've been out all day so I didn't see your other comments until now. Glad you've sorted out your coding problem.